Got yourself a new bow sight recently and wondering when do bow sights work best? Well even for a seasoned hunter or pro shooter, there are definitely some tips and trips to be learnt first. So keep on reading and school yourself using your new device properly. A bug out bag, popularly known as a BOB, is essentially a portable survival kit that consists of items referred to as Bug Out Bag Essentials. These are items that need to last for at least 72 hours, with the main focus being on evacuation and short-term survival. An EDC Kit is made up of the everyday carry gear including emergency EDC essentials that you might need to face challenges or dangers. But just what exactly should you be carrying with you each day? This article is all about Building The Best EDC Kit. 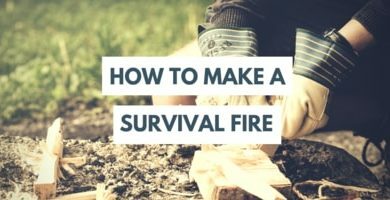 If you find yourself in a survival situation in cold weather, nothing is as important as knowing how to make a survival fire. Hypothermia can set in when your body temperature drops by as little as two degrees. Starting a fire may be the only thing keeping you alive. Take action and learn about emergency survival food preparation for you and your family today. There are plenty of normal everyday situations that could occur where having some form of food preparation organized may be you savior. This is how. Recently I purchased the Exotac nanoSTRIKER XL Ferrocerium Fire Starter for my step dad. He liked it so much that I decided to get one myself. I felt it only fitting to share my experience with using this neat little tool. Enjoy my Exotac nanoSTRIKER XL Review right here.